Why do people search for the perfect running pace? There is nothing wrong with wanting to win a race, obviously. And I myself love the physical feeling of skimming across the ground as fast as I can. Regarding qualifying as a runner, while there are running snobs, running is a matter of form. A relatively slow run is still a run. 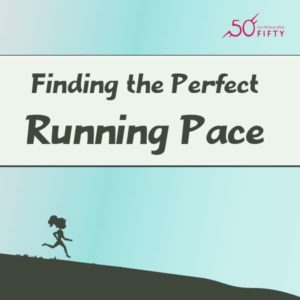 Is there such thing as a perfect pace? What is your perfect pace? The perfect running pace is the pace that you enjoy and are happy with. The problem is that some of us need to learn to be happy with our current capabilities and enjoy the moments. We need better points of evaluation for deciding on and grooving with a certain pace. Here are my criteria for deciding on my perfect pace for any given day. The last part of that sentence is really important. No one can or should run at the same pace all the time. It can be harmful and it isn’t necessary for improvement. Am I enjoying my run? Can I think clearly while running? Is it a familiar route? What is the distance overall? What is the distance compared to my longest runs? What has my other recent activity been? What other activity is in the near future? What injuries am I recovering from or concerned about? How do you know if you are enjoying your run? There are different ways and reasons to enjoy a run. You can just be focused on the immediate flow, letting your mind relax and breathing fresh air. This can be enjoyed at almost any pace, although I don’t enjoy speed workouts this way. You might be enjoying a run because of who you are with or because of being able to run in a particular place. I like to run with my husband, even if it makes me feel slow or he wants to explore places I get lost in. I also enjoy finding new running routes when we go traveling. Sometimes running is a chance to listen to a story or podcast without being distracted. It is also possible to enjoy a run because of a feeling of accomplishment. It can be an accomplishment just to go out and do something. Maybe it is a step toward a particular goal of distance or race training. Maybe it is a mix of all of the above, but whatever it is, enjoying your run should be an important part of running. What should you think about while you are running? It is a fact that the harder you are breathing, the harder it is to think about anything else. You can’t think about where you are going as easily, or sometimes fast enough. You can’t think as clearly about your form, so hopefully you have practiced good form enough at a slower pace. Any speed that kicks us into anaerobic cell processes is not sustainable for very long. This is probably good because how it limits our thinking can have harmful consequences. That speed will be different for different people. Some people seem to have more efficient aerobic systems. I know my husband has comparatively large lungs. Some people have trained in ways that have built up their aerobic base. What too many runners don’t realize is that even top level runners don’t always run at their top speeds. This has been a prevalent theme in all running biographies I have read. A large percentage of good training is done at a speed where there can be some conversation. The mind can wander creatively over events and issues, often problem solving much like during sleep. Are you hitting a road block on a project or do you need to think about some important communication? Go for a run and let your brain think about it! Have you ever run on dirt moguls? There is a path along the Snake River that my husband likes to take me running or hiking on. Sections of it have undulating, hard-packed miniature mountain ranges. It is very difficult to find a comfortable pace through these sections. Running too fast often results in unexpected landings and hard impact. I run slower through there. There are many other variations of terrain that affect speed. Loose gravel, tree roots, trail switchbacks, and stream crossings are just a few examples. There is a reason that most official races for speed on are even ground with few turns. Variation in terrain can be very good for building up more muscles and for avoiding the fatigue of repetition, but it usually means slowing down, too. If you don’t slow down on purpose, you will probably end up slowing down with a face plant or skinned knee. Your perfect pace in such conditions will be one that allows for maneuverability. Similar to my issue with the dirt moguls, you will want to run slower to give yourself reaction time. Hills will slow you down whether you want to or not. The thing to remember is that unless you are doing a specific, and hopefully relatively short, hill workout, trying too hard on hills is counterproductive. If you are training, give your body time to gradually get stronger. If you are in a race, trying to hard on a hill will deplete your reserves for the rest of the race. There has been many a time during a race where I have passed people after a hill who passed me on the hill. I have come to a new understanding of high elevations in the last couple of years. We discovered that I get significant elevation sickness up around 8000 feet above sea level. That is, I get kind of loopy and go into slow motion. If you are trying new, higher elevations, give yourself time to figure out how your body will respond. Seriously consider researching what to expect. Even if it is not an elevation to cause the kind of reactions I had, any significantly higher elevation will slow you down. Don’t worry about it. You are still getting some good exercise and can enjoy your run. If I am running somewhere unfamiliar, I don’t push the speed. One reason is that I get lost easily. I don’t want to end up somewhere in an exhausted state. Even if you don’t get lost easily, unfamiliar routes frequently end up being longer than expected for various reasons. It is best to save faster runs for familiar paths. Distance is inversely proportional to overall speed for everyone. No one can run their fastest over their longest distances. Pushing yourself to keep a faster pace than is optimal for a given distance will both decrease your enjoyment and predispose you toward injury. Take time to learn how pace is affected by distance and feel free to experiment with a pace that you can sustain. This will actually make you stronger than trying to run in a semi-anaerobic state so much of the time. How do you want to feel after your run? Most of the time, I would just as soon feel like I could have run farther or harder than I did. Sure, there are some long runs or speed drills where this is not the case, but you can’t have constant strain on the body and still expect it to recover in healthy ways. You want the stress of training to be slow and gradual overall so that the body has time to adapt. In light of this, for any given run you need to take into account recent previous training and planned future training. It is foolish to do one of your longest runs on one day and then do hard speed work soon after. Something is likely to snap! If you avoid pushing unhealthily hard, when you do get injured it probably won’t be as severe. It also might be the sort of injury that does not mean you have to be an invalid. I have kept running, swimming, dancing, biking, and gardening through a variety of minor injuries. Sometimes I need a couple days rest, but then the continued movement actually helps strengthen the compromised body part. During these times, I don’t push the speed at all. I concentrate on good, light form. There are a few times when I have ended up with surgery or immobility. After such times, the perfect pace is one that lets me slowly regain my stamina and build up my muscles again safely. It can be discouraging to feel like I have ‘lost’ what I worked for previously. In some ways it is a setback, but in other ways I have to remember that I am still stronger overall than if I hadn’t been active. Plus, there is a certain mental strength required to keep coming back after a setback. I take satisfaction in that, too. 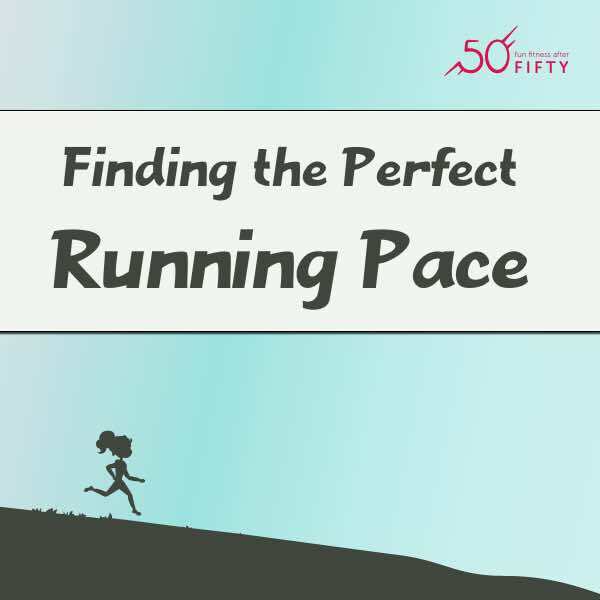 Have you found your perfect pace? Hopefully, you now have a picture in your mind of your perfect running pace. It is a pace that will change depending on both outside factors and personal needs. It is a pace that you will have to experiment with regularly and adjust many times. It is a pace that you will customize in spite of what other people are doing, because the most important goal is not how fast you are compared to someone else. Your perfect running pace should make you happy and make you feel good. Who wouldn’t want to be interviewed on a show with Super Human in the name? But really, people give me too much credit for running barefoot. It may take some hutzpah to go against social norms, but bare feet make running more fun! There were some points in the interview I’d like to explain, just for the fun of it. Like, at one point, Carl asks me about my feet being too ugly or rough for my husband to massage them. He put it in the context of watching TV. I don’t like to sit and watch TV very much. We are frequently eating when we are both sitting and watching something, so not an ideal time for foot massages… Also, if I do sit for a show, I often have a crochet project or something I am working on. It is also helpful to consider that everyone has their own “love language.” One of my husband’s is making things for me, like the incredible set up I have for my Endless Pool or my beautiful, handmade cement greenhouse table. I will take those things over a foot massage any day! Besides that, I actually go in for a full massage pretty regularly (as does he), so we are in no way massage deprived. All that being said, my husband does occasionally massage my feet and he does not think they are ugly or unpleasant to touch. Another thing I’d like to mention is that I believe feet were designed. Yes, by a creator. I don’t think wearing particular footwear is going to cause evolution. Instead, poorly shaped or inflexible footwear will only result in maimed or weak feet, even in the long term for the population. What Kind of Shape Will You End Up With While Getting In Shape ? What is your perfect shape? Picture yourself in perfect shape. What do you look like? Wait. Think carefully. Is it really you? This is a mistake that is made too often. We form an ideal in our head that has no basis in reality. And we allow that imaginary ideal to rob us of enjoying both our progress and our temporary peaks of perfection. 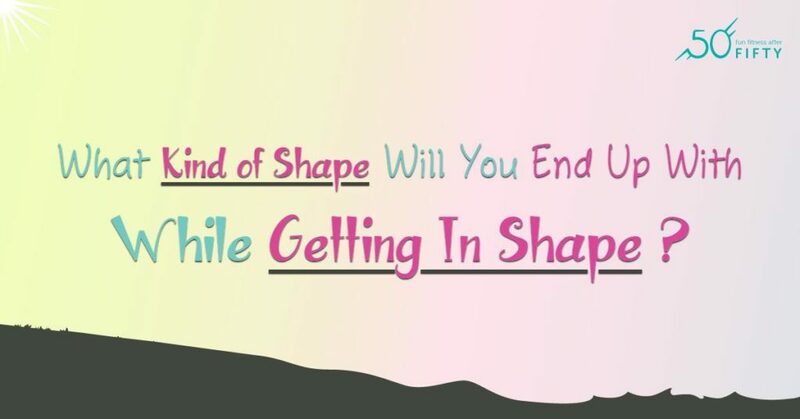 What is your shape? Don’t tell me it is fat or something like that. We can discuss ideal weight later. Right now, just think about what your basic shape is. Or what would it be if it didn’t have some extra padding. Everyone’s basic shape is made up of a combination of factors. Nearly everyone complains about their shape at one time or another and wishes they had someone else’s shape. There is a pervasive illusion that someone else’s shape would magically make staying in shape effort free. Why do cartoons have extra large eyes? Part of the problem is the way two dimensional images look. It is very difficult to capture the vitality of someone in photos, drawing, and even cartoons. All kinds of tricks are used to make up for this flatness. What often happens as a result is that we forget what normal bodies look like. For instance, I remember the first time I realized that the drawings on sewing patterns always had extraordinarily long, thin legs. I have never seen anyone in real life with legs that long, not even when aided with high heels. This was a technique to sell the styles because that is how people want to look. I also learned that how a real, photographed model stood might be hiding something about the pattern or at least giving a false impression of how the garment would usually look. She was probably also standing in a way that was almost cartoonish, meaning people just don’t stand like that a lot in real life. I learned to ask myself how often I would be in that actual pose. Speaking of cartoons, have you ever noticed how abnormally huge certain features are made? This usually looks nice on the cartoon, but would look hideous on a real person. We need to be careful what we compare ourselves to. What about our perception of real people? There are two main pitfalls when it comes to comparing ourselves to other people’s “shapes.” First, we often concentrate on their desirable features and don’t notice their problem areas (or what they think their problem areas are). Secondly, we tend to see them at a particular optimum moment. If they are good at picking styles that work for their shape or just have good posture, we may misinterpret the effect. Obviously, I appreciated the compliment, but I was not who I would have picked to look like. Also, as I glanced at her, it was unlikely she would ever look like me. It is ironic that some of the features in myself that I think are “less than feminine” are often what give some women the impression of something they want to be. I say “impression” because I get a pretty good idea of what they think they are seeing. They don’t understand the whole package. I’m getting better about not complaining about my shape. I try to spend my energy on working with it. One thing that has helped me is being realistic about how bodies change with things like position, use, time. We move and our bodies change shape as we move. That is normal. Sometimes, some parts of us scrunch up, like when we bend forward in the middle. If there is no bunching of flesh when we do that, we are probably ghastly thin. Our shapes, being a large part water, also change if we hang one way or another. My cheeks are notorious for this. I KNOW I use my mouth enough for my cheeks to “be in shape,” so it is not fair that they go with gravity at the slightest opportunity! Because our shapes change as we move, clothes that are not designed to accommodate this will be too tight in some positions or too baggy in others. This does not mean that we are the wrong shape or that we are too fat (again, a subject for another time). This is why yoga pants are so popular. Even an amoeba might be able to wear a pair of yoga pants! Life experiences may alter our shape potential. For women, the most obvious example of this is child birth. An abdomen that has been stretched to that degree will rarely get back to pre-birth shape. As we age, all of us have to face decreasing skin turgor and comparative loss of muscle capacity. We can recognize this and still make amazing progress toward both a healthy and visually pleasing shape. If you want to make progress toward your optimum shape, there are realities you need to be aware of. Good health is not limited to a certain shape. Not everyone is attracted to the same shapes. People tend to gain weight in different places. Use of devices to obtain a certain shape will restrict and weaken the body. How you feel may be at odds with your idea of the perfect shape. Zero body fat is not very shapely. We each may have to experiment with what weight and muscle tone combination results in a shape we can be happy with. We also need to choose to be happy along the way to our occasional personal peaks of perfection. We need to give ourselves permission to be satisfied with our bodies in general. It is not selfish or vain to be content with the body that you were given. You can do that at the same time as working on keeping it in good shape, for both aesthetic and functional reasons! can be two of the most negative things you can say to or about yourself. Why do people say them so often? 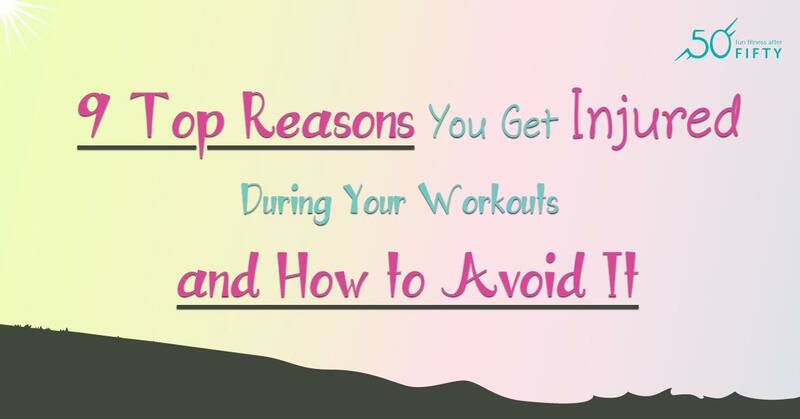 Can they be realistically avoided? 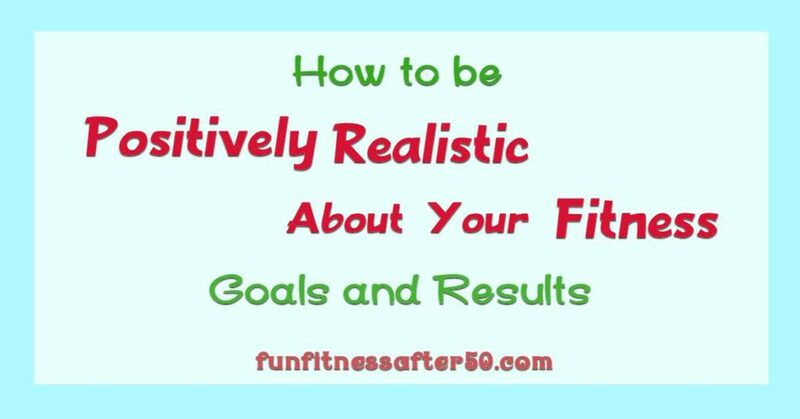 Do you think being realistic about fitness over the age of 50 is at odds with having a positive outlook about it? I can’t run 27 hours a day. On work days, I can’t justify spending 2 hours per day at the gym. I didn’t finish the race this time. I didn’t learn how to swim yet. Coming up with more complete thoughts is key to any problem solving. Be specific. Try to communicate to yourself what you think your real frustrations or limitations are. 1. Make sure you are not just making excuses. 2. Ask yourself if you are willing to take the necessary action. Many of the things we say we can’t do could be things we can do if we are willing to take habitual steps. Why waste your time and mental energy saying what you can’t do. Rather, spend the time figuring out how to get the results that will make you happy. 3. Consider why you may want to do these things. There are a whole range of goals that can be fun and motivating. Do you want to go on an exotic hike that you could never have afforded or had time for when younger? Maybe you could set a world record for you age group in something? It could be as simple as the whole family signing up for a local event together. We may have passed the physical prime of life, but isn’t always as limiting as we think. A lot of time our age just a measure of time past and our bodies have much more potential than we assume. We just need to get out there and use them! 4. Keep the past in perspective. Remember when you were in the physical prime of life? Were you actually in prime physical condition then? Switching those words around makes a big difference. 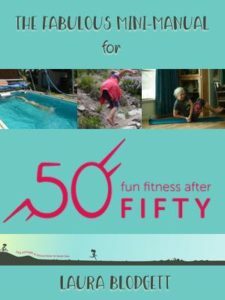 It is quite possible that you could get in better shape now that you were for most of your previous life. 5. Never forget that problem solving is part of the process. No matter what your age. Be prepared to work around unexpected injuries or weather. When you discover certain body parts are weaker than you anticipated, look for ways to make them stronger. If your friends don’t want to join in, find some people with similar interests for camaraderie and insight. 6. Have the whole journey in mind. Don’t obsess about times or individual events. Enjoy doing the best you can and call it a win, even if you don’t finish a given race. Allow yourself to be satisfied with the progress you have made. 7. Avoid comparing yourself to the pinnacle performances of professional or full time athletes. Sensational news gets the most headlines, but even the top athletes are not at their peak or at the top of their sport all the time. If they or you are only going to be happy with absolute perfection, it is going to be a disappointing life. 8. Don’t be shy about questioning conventional thinking or equipment. You might be amazed at how much standard practice is based on clever marketing or misguided presumptions. It is quite possible that the approaches that kept you from enjoying activity when you are younger will still keep you from enjoying it now. How much difference does age make? It is undeniable that age has some impact on our physical capabilities. However, it is kind of like the question of talent versus practice. Any experienced music teacher or coach will tell you that practice can often overcome relative lack of talent. Desire and dedication go a long way toward overcoming disadvantages. Keeping the above points in mind will help you stay realistically positive. Youth is fleeting, but you can feel younger by working wisely with who you are now.